Over the years, signs of pollution in our water and soil has caused more people to take a closer look at the exact toll road salt and deicers has taken on the environment. For example, researchers at the University of Minnesota found that 70 percent of the salt applied to the roads near the Twin Cities made its way into the region’s watershed. This could not only affect the taste of the area’s drinking water, but also harm aquatic life. Those same researchers found that applying bulk salt to pavement that is colder than 15 degrees Fahrenheit is typically not effective. For property managers and snow removal contractors, this means that pretreating roads and walkable surfaces before they reach that temperature is essential. If done correctly, this should result in having to use less bagged material on roads and walkways. We’ve spent a lot of time talking about the benefits of salt vs liquid deicer, but we haven’t discussed the many different ways that the chemical makeup of your preferred deicer can affect our ecosystem. The two main types of deicers are chlorides or acetate-based. Without getting to far into the chemistry, chlorides and acetates are both salts, but they are derived from different compounds—chlorides from hydrochloric acid and acetates from acetic acid. 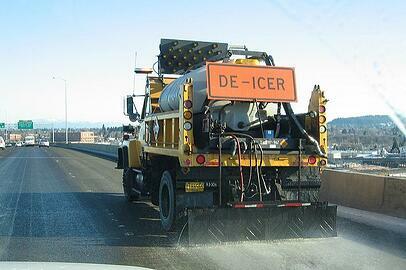 It’s this difference that determines the effect that the deicers will have on the earth. Chloride deicers are widely considered to be the most biggest polluters because they’re not biodegradable, which means that they can easily make their way into groundwater and soil. Plants that come into contact with chlorides can have a difficult time absorbing water and nutrients from the soil, causing them to dry out. While acetate-based deicers can result in much less runoff than chloride based ones, research shows that they also make it more difficult for soil to retain water and air. Depending on the location of the acetates are applied, this could result in structural vulnerabilities over time. Carbohydrate deicers like beet sugars are often praised because they’re a natural, non-salt alternative to industrial deicers, but even they are not without their disadvantages. For one, they don’t melt ice, but instead lower the freezing point of ice more than salt can and helps bulk material to stick to roads better (and therefore less of it needs to be applied). Therefore, it’s most effective when used alongside salt or liquid material rather than in place of it. Salt and other deicers (no matter whether they’re chloride or carbohydrate based) that’s applied to roads can attract animals who like the taste, such as birds and members of the deer family. This can lead to an increase in roadkill accidents. As we mentioned above, deicers can affect the salt content of the water, and when local water sources are polluted, animals are often the first to pay the price. Research indicates that freshwater amphibians like newts and salamanders become stunted and deformed when exposed to waters that are high in salt, and the animals that feed on them also suffer as a result. 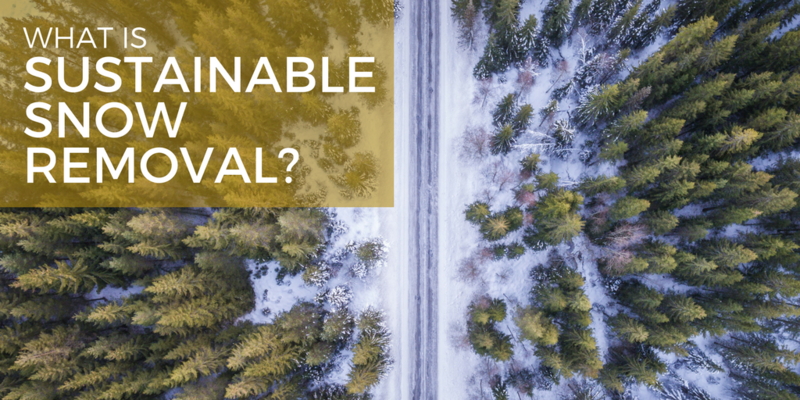 Increasing sustainability in the snow removal industry: What can we do? Schill Grounds Management is committed to always try to reduce our impact on the environment, but safety is always our first priority. 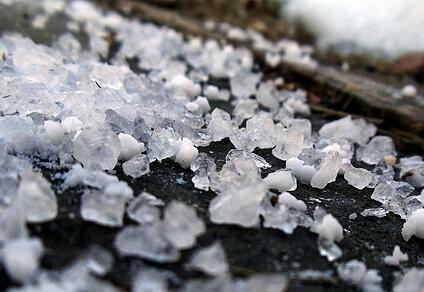 Simply put, deicer on the roads and walkways means fewer crashes and slip and falls. That being said, there are many practices that we have implemented that are better for the planet. The Schill team loves alternative fuels. 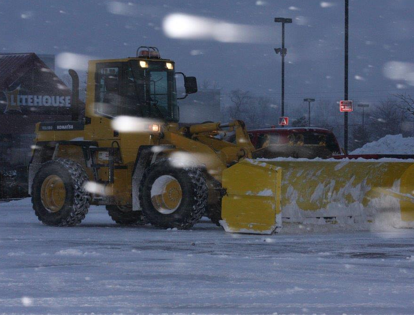 We’ve written a lot about our use of propane for our fleet of over 100 lawn mowers, but many of the trucks and snow plows we use for snow and ice removal run on diesel. While it wasn’t the case even ten years ago, diesel is now the most carbon-efficient fuel for more modern, larger vehicles, as they can have 40% fewer emissions than vehicles that run on conventional gas. As we discussed before, no deicer or ice melt product is without adverse effects, but liquid deicers and blended products can have a much smaller impact on the environment. Here at Schill, adopting liquid deicer as a pretreatment on the properties we manage has not only saved our customers thousands of dollars worth of bagged material, but we’ve also been able to save clients thousands of dollars in plant replacements the next spring by using winter products that are less harmful on trees and shrubs. Natural products like beet juice and cheese brines (which, again, can still negatively affect the earth) aren’t the most effective for commercial use because they aren’t as effective at melting ice and therefore still need to be combined with other ice melt products. Instead, the Schill team also uses blended products that have allowed us to reduce the amount of bulk salt that we apply. The liquid deicer we use is more effective than natural alternatives, therefore allowing us to use much less salt than they would. The snow removal industry needs take responsiblity for setting standards for how much deicer is appropriate to use in certain situations. Here at Schill, we use equipment that’s calibrated to make sure we know exactly how much salt or deicer is being applied, and that we’re only putting down what’s necessary. We're able to calculate how much deicer needs to be used per snow/ice event based on road & ambient temperatures, as well as the efficacy of the product being applied. Here at Schill, we’re always thinking about how we can be better stewards of the environment. Because of this passion, we love talking with potential clients about how sustainability can positively affect their company’s bottom line and improve their corporate culture. If you’re in the Northern Ohio area, don’t hesitate to contact us for a no-obligation consultation.